Even though I think the term “snack cake” may just be a cleverly designed justification to allow cake-eating anytime of the day, I really have no problem with how or when or why people eat their cake. But I also know that if I’m going to feed cake to me and mine at, say, 3 p.m. on a Tuesday afternoon, I’d like it to be unindulgent enough to satisfy energetic, growing tummies but still leave a little room for dinner. 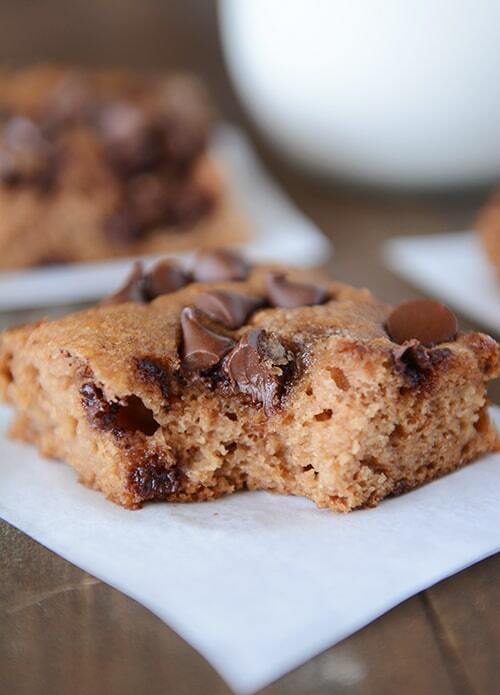 Enter this applesauce snack cake. Sweet and treatsy enough (thanks chocolate chips) to be a cake but low enough in sugar and oil to still be a snack, I think we may have truly stumbled upon the best of both worlds. Because this light and fluffy cake takes just minutes to stir together, we (meaning the kids) make it all the time (it also doesn’t hurt that Brian works for an applesauce company and so we honestly have applesauce coming out of our ears – if you come to my house, I’ll probably bequeath you some applesauce pouches, just sayin’). It’s fantastic with whole wheat flour in place of the all-purpose, too, especially if you are already at peace with the taste and texture whole wheat brings to the baked goods table. Yum to all of that. This tasty treat is delicious warm or not and may even be better the next day in my professional snack cake opinion. The really glorious news? If you wanted to add a scoop of vanilla ice cream or fro-yo to a serving of the gooey, warm cake right out of the oven, no one would be the wiser that it’s slightly on the healthier side of the cake spectrum. I know this because at least twice in the last month, this cake saved me when guests showed up unannounced and I had no dessert within a 100 yards to serve them (plain vanilla ice cream and freezer burned cookies don’t count). Forty minutes or less of idle chatter and the cake was made, baked and served…and disappointment averted. Phew. Applesauce snack cake, I think I love you. Preheat the oven to 350 degrees F and lightly grease a 9X13-inch baking pan (preheat to 325 degrees if using a glass pan). In a large bowl, whisk together the applesauce, coconut oil (or butter), eggs, vanilla, granulated and brown sugar. 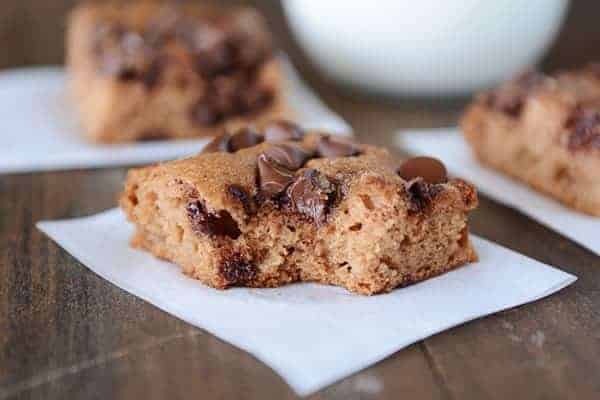 Add the flour, baking soda, salt, cinnamon, nutmeg and chocolate chips (adding the chocolate chips with the dry ingredients helps prevent them from sinking to the bottom while baking). Stir until just combined. Don't overmix. Spread the batter evenly in the prepared pan. Sprinkle the brown sugar and chocolate chips for the topping (if using) evenly across the top. Bake for 28-30 minutes until the top springs back lightly to the touch and a toothpick inserted in the center comes out clean (although a smidgeon of melted chocolate is just fine). This cake keeps for several days well-covered at room temperature. This recipe works great with whole wheat flour although I highly recommend using soft or hard white wheat (hard red wheat will give it a denser/coarser texture). I've used a 50% whole wheat/50% all-purpose flour mix as well as making it a couple times with 100% white whole wheat flour. Delicious either way, especially if you are used to the taste and texture of whole wheat in your baked goods. Just like the ingredient list suggests, the topping is optional but adds a delightful texture to the top of the cake and of course, a tad more chocolate. I made this yesterday for my kids after school snack and they finished the entire thing! It was delicious and a perfect treat but less treaty at the same time. Thanks for another winner! I need to comment more often just so people know how awesome your blog is. I honestly can’t think of anything we’ve tried that we didn’t like and we are talking hundreds of recipes! This cake was just right. Not too sweet, very moist, with a little cinnamon and chocolate for good measure. Made this with all white whole wheat and it was delicious!! Made a great after school snack. I absolutely loved the texture! I made these tonight and they were heavenly. 1/2 Whole Wheat and 1/2 All-Purpose and the texture was light and soft yet sturdy. There are countless food blogs out there and I’ve had varying success with them. But with this lovely recipe I’m anxious to try more from Mel! I am obsessed with this cake! I had a bunch of very tart homemade applesauce from crab apples in my freezer. It had been there for a while but now I’m flying through it making this all the time. 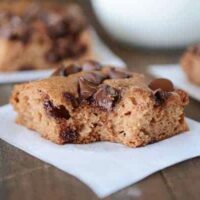 It’s so delicious and moist and light even with all whole wheat flour. I’m making it into muffins today as intend to eat half the cake myself in 24 hrs and somehow half the muffins gone seems less shameful than half the cake gone. I’ve made this several times! But today I was out of milk chocolate chips so I added white chips instead. My husband and I are not fans of white chocolate but we really like it in this! It adds a whole new depth of flavor! This was just amazing! So very moist. I made it with half whole wheat and half all purpose. And yes, I’m choosing to believe it can be eaten at any time since it has snack in the name! Making this for the 4th time today. I feel okay letting my kids eat it for breakfast when I serve it with some sausage links or yogurt. But it’s also tasty enough that it makes a good afternoon treat. The first time I made it I took it to a homeschool activity and it got gobbled up so fast that my kids begged me to make it again so they could actually have more than one piece! I’ve made this twice! So good. This time I did muffins. I got 19 regular and 12 mini. I cooked the mini for 14 minutes, and the regular for 17. Yummy!! Delicious! My kids licked the plate with this perfect after school treat! When I was a kid some company…maybe Betty Crocker,,,sold snackin cake mixes. Super easy…8 X 8 pan…no icing…cake. I LOVED them. I am not an icing person…the cake is always my favorite part. There were different flavors but the one I remember clearly was a banana nut. This recipe reminds me of that. I know it will be enjoyed! Can regular applesauce be used instead of sugar free? Sure, but depending on the sugar content of the applesauce you might want to cut down the sugar in the muffins. Made this on Friday to take to a playdate with some other homeschool families and it got gobbled up, so my kids begged me to make another pan for just our family so they could actually have more than one piece! Huge hit! Made these last week to take on a long car trip and vacation in Washington, DC. They held up well and made for good snacking while in the hotel room. Thanks again Mel, for a great treat! made this today with my 41/2 year old, DELICIOUS. thank you for this recipe!! Made this on monday and took it to the beach to share with friends. Great great recipe! They loved it! Thank you for all your amazing help in the kitchen. I cant’t believe how lucky I was to sit next to a woman on an airplane who told me about your website. Your recipes ROCK! You could probably be my daughter or little sister, but I surely could have used your recipes, humor, and insights 30 years ago when I was raising my family. Keep on cooking and baking! Just bring it on! Thank you, thank you. This may be just perfect for my hiking trip, especially since these do not need refrigeration! Thanks! I tried the recipe this morning with mini chocolate chips in cupcakes. The kids love them! This looks delicious! I am excited to try it! This was delicious! I added some chopped pecans to the topping and it turned out great. Made this yesterday. We ate half the cake while it was warm. My son just got up and asked if he could have some for breakfast. I said yes….it has applesauce in it, therefore it is healthy…thus this cake is a healthy breakfast. 🙂 Thanks for another great one! I made this today and it is really good. I used fewer chocolate chips because I was short on those and did not want to go out to the store, but it was still great. It tastes very applesauce-y and was really moist. 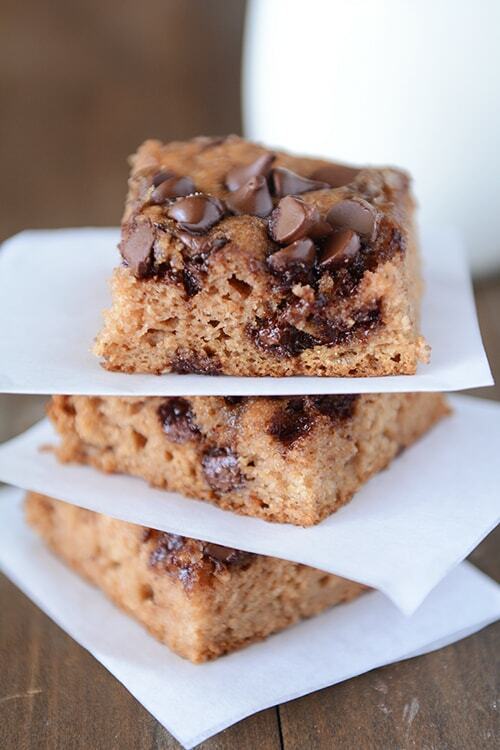 Our favorite is your chocolate chip cake, but that is definitely an indulgence. This is much lower in fat and sugar and is really a great snack cake, just like you said, thanks so much. I am very at peace with the wonderful contribution whole wheat flour brings to the nutrition and taste table. Thanks for this yummy-sounding recipe. Going to try this today! Looks so delicious. I have a ton of apple sauce hanging out in the freezer needing to be used. Can’t wait! Do you think these would freeze all right and then just take them out when you want a snack? Or would the texture not be right? I love doing that with brownies. A treat is only an open door away! Yes, this should freeze really well! Mel, I love how you take recipes, make them healthier (by using whole wheat, less butter, less sugar, less oil) yet they taste wonderful. Thank you, thank you, thank you from a mother’s heart! I’ll check back with results which for years now has been exactly what you state in the post.